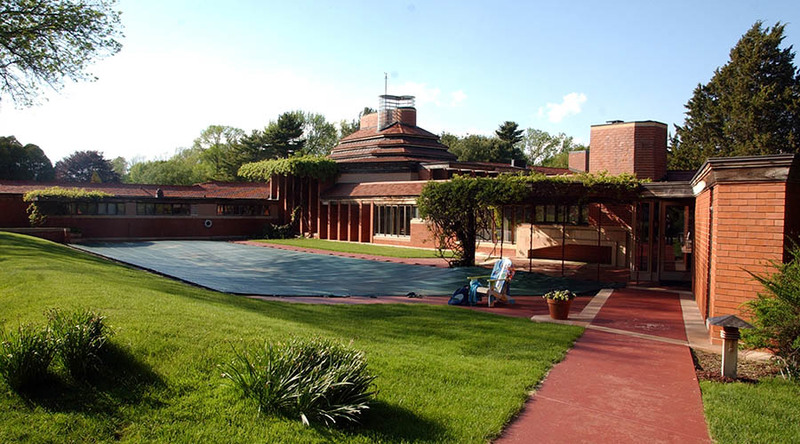 Wingspread is the residence Frank Lloyd Wright designed and built in 1938-39 for the Herbert Fisk Johnson family. Shaped like a four-winged pinwheel, the 14,000-square-foot house balances grand spaces for social gatherings in the Great Hall with smaller, more intimate spaces in the bedroom wings. Set in a 30-acre property with a wooded ravine and a series of ponds and lagoons, Wingspread spreads elegantly across its gently rolling site – a site that Wright found “not at all stimulating before the house went up.” Even more than many of Wright’s earlier Prairie Houses, Wingspread seems to be the epitome of his “organic” architecture. Its four wings stretch elegantly out to embrace the prairie. Its primary materials – limestone, brick, stucco and wood – tie the house to the earth. From the center of this array of horizontals rises Wingspread’s 30-foot-high chimney, with five fireplaces on three levels. 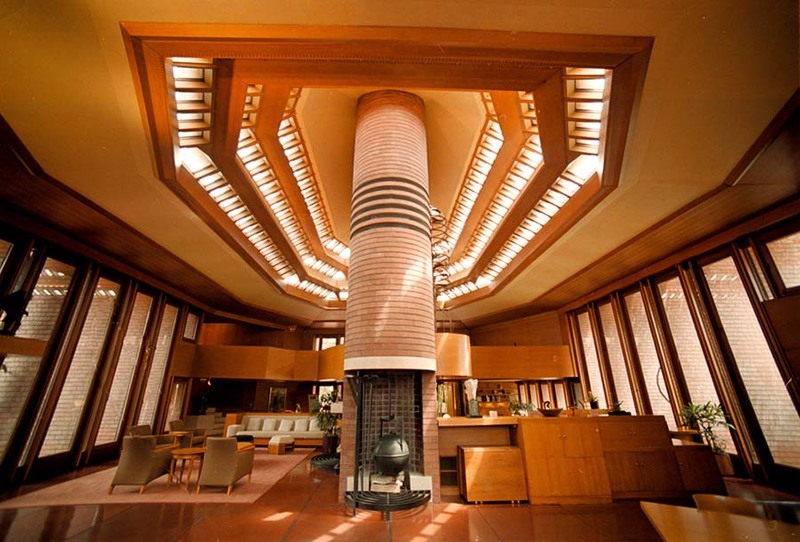 The chimney of warm brick is complemented by expanses of oak veneer, and bathed in the changing light from overhead and from the floor-to-ceiling windows that surround the Great Hall. At night the living room glows like a fire-filled lantern. The Johnson family lived at Wingspread for 20 years in the last and largest of Wright’s Prairie Houses. 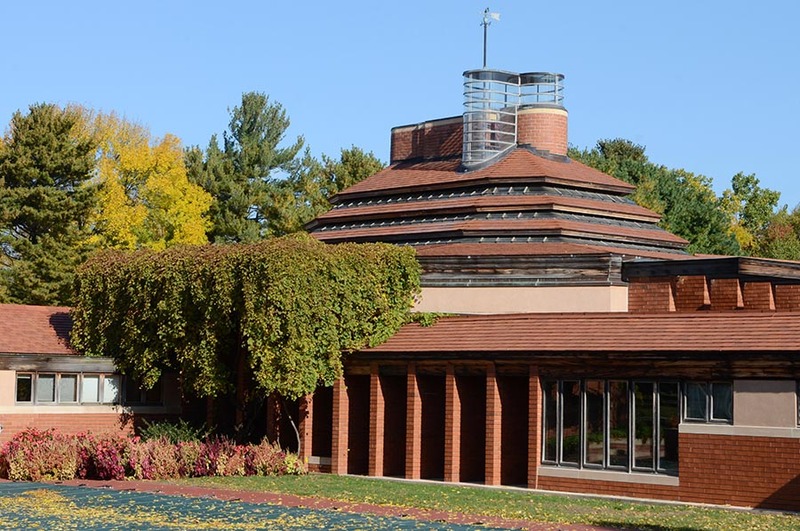 Wingspread was given to the Johnson Foundation in 1959 as an educational and conference center. A formal dedication ceremony was held on June 24, 1961, at which Wright’s widow, Olgivanna, gave a brief speech. Since 1960 the fireplaces have been the gathering spots for men, women and young people who come to Wingspread conferences from around the world. They come as guests of the Johnson Foundation to meet, plan and share ideas that will make a difference on behalf of the public good. National Public Radio, the National Endowment for the Arts and the initial blueprint for arms control all had their roots in Wingspread conferences. Wingspread was designated as a National Historic Landmark in 1989. To schedule a tour, call (262) 681-3353. Wingspread is available for tours by appointment only. Tours are available Wednesday - Sunday. Please be aware that some dates may not be available for tours due to conferences scheduled on site. Grounds are not available for weddings or other social gatherings.